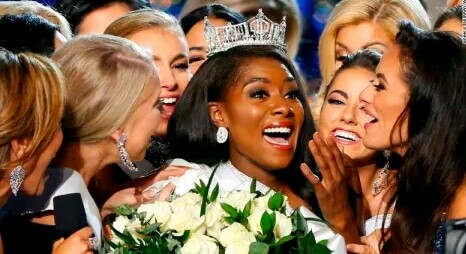 Miss New York Nia Franklin has taken over the crown of Miss America from Cara Mund at Sunday’s crowning ceremony held at the Jim Whelan Boardwalk Hall in Atlantic City, New Jersey. The show which was hosted by Carrie Ann Inaba & Ross Matthews saw the North Carolina native beat 51 other contestants to the coveted crown. She once saved her father’s life. 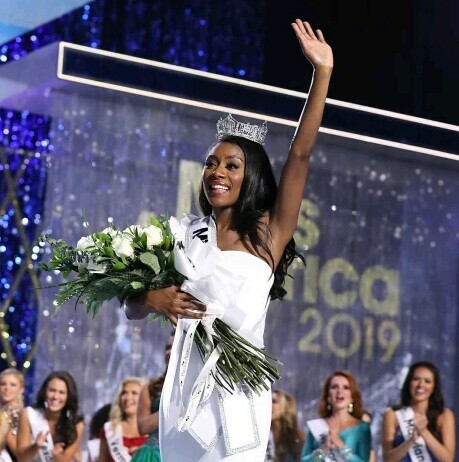 The annual Miss America pageant took place Sunday night in Atlantic City, New Jersey, and Nia Franklin of New York took home the coveted title and crown. 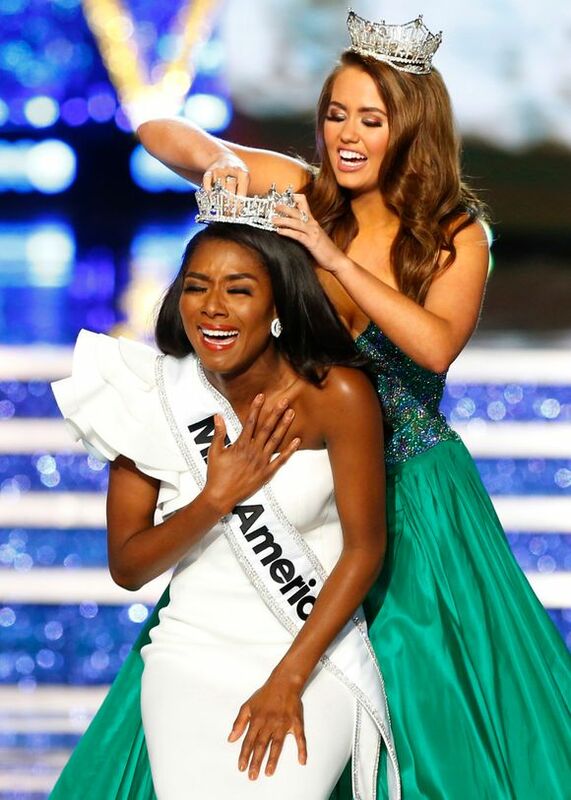 The organization behind Miss America has been making headlines this past year even before the pageant began. It was decided that the swimsuit competition — a topic that has been widely debated among beauty pageants — would no longer be included. starting with this year’s event. Naturally, changing a routine that has been ingrained in American culture for nearly an entire century was met with criticism. While some fans of the program deemed the decision to nix the swimsuit portion unnecessary, others felt it was actually a step in the right direction, especially as many women are the subject of body shaming and continue to feel the pressure to maintain unattainable body standards. One person who was happy to see the swimsuit competition go? The newly crowned Miss America herself. Following her win on Sunday night, Nia opened up regarding her outlook on the much-debated topic. She went on to add the positive effect the organization’s decision has had on other women as well. Gretchen Carlson, who is the chair of the organization and a former Miss America herself, came to the decision to scrap the swimsuit portion in an effort to not only keep the pageant current but also in light of the events surrounding the #MeToo movement. Despite the Miss America contestants being accomplished young women, so much of the focus has always been on their appearance. And while all of them are certainly beautiful, perhaps now there will a shift in focus on their accomplishments and the incredible ways they have given back to their communities — as opposed to how good they look in a two-piece. Although she represented the state of New York for the competition, Nia actually grew up in North Carolina. 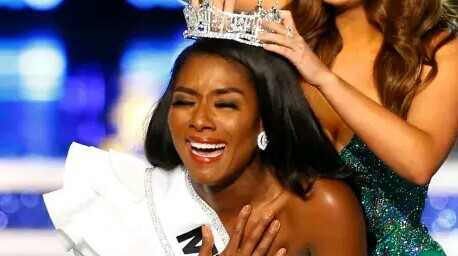 Despite not being a born and bred New Yorker, she believes having lived in different communities, as previous Miss New York’s have, gives her a broader perspective. 2. She is a singer and songwriter. Nia’s talent for the Miss America pageant was operatic singing, something she discovered while looking into studying music composition. The schools that Nia was applying to for musical composition, however, required the ability to play an instrument. Though Nia could play the piano, she didn’t feel comfortable enough to play for an audition. Because of her strong singing background, including performing with her church and school choirs, she decided to study classical voice instead. In addition to singing, Nia is an accomplished songwriter and composer. She has even performed at New York City’s prestigious Lincoln Center. 3. She is an advocate for arts education. That love of music has transcended into her advocacy for the arts in America’s education programs. Nia has discussed in interviews how she grew up taking classes in music and the arts, frequently taking as many of these classes as she possibly could. While obtaining her master’s degree, Nia was a member of ArtistsCorp, a sub-organization of AmeriCorps. During this time she would teach music in schools that didn’t have formal music programs. Though she had always been involved in her community, she discussed how a particular moment while teaching at a preschool inspired her to become an arts education advocate. By discovering how music had positively changed the life of one of the young students, Nia realized just how important music programs are, especially for children. 4. She has a master’s degree. In case you weren’t inspired enough already, at just 24 years old Nia also has a master’s degree as well. She received her undergraduate degree from East Carolina University and earned her master’s at the UNC School of the Arts. According to the Winston-Salem Journal, which is based out of Nia’s hometown in North Carolina, she has also expressed an interest in composing music for movies down the road. 5. She donated stem cells to her father and helped save his life. On the official Miss New York Instagram account, Nia shared the story with her followers. Her dad had been diagnosed with non-Hodgkins lymphoma. Though he was treated with chemotherapy, he relapsed twice and it was decided that a stem cell transplant would be the best course of action to save his life. Nia turned out to the best match for her father and became his stem cell donor. The transplant took place on May 1, 2013, and her dad continues to be “alive and thriving”. It’s safe to say he must be incredibly proud of his accomplished and inspiring daughter.